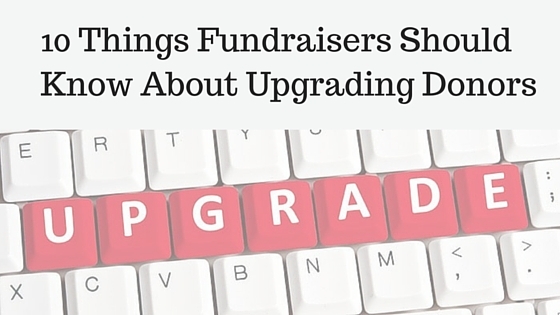 Guest Post: 10 Things Fundraisers Should Know About Upgrading Donors | What Gives??? Upgrading donors is an essential part of your nonprofit’s fundraising program. Or at least it should be. Upgrading begins at the point of acquisition. But not all donors can be persuaded to upgrade. The lower their initial gift (i.e. $15-$18 range), the more difficult it can be to upgrade a donor. For this reason, make sure you test your acquisition ask string (the gift amounts you’re asking people to give) at least once a year. You want to bring donors on at the highest average gift without negatively impacting your response rates. If you can acquire a high volume of donors at a better than $20 average gift, you’ll have a very good chance at upgrading them in the future. Build a rock solid thank you process. Want donors to give more generously? Show them they matter by: a) promptly and genuinely thanking them for their past gift(s), b) sharing compelling stories about what their gifts have accomplished, and c) proving you’ve done what you said you’d do with their gifts. Getting this right will inspire donor loyalty and increase the likelihood that donors will upgrade when you present them with the next compelling opportunity. Have a big vision. Getting donors to increase their giving isn’t easy. You can’t expect a donor who gives $25 to provide hot meals at a shelter to give $2,500 just to provide more meals. Donors substantially increase giving because you inspire them to think and act big. That’s why middle and major donor programs often take advantage of offer bundles (where you combine a number of tangible program needs into one larger fundraising offer), special project campaigns and capital campaigns. These initiatives are tied to a larger vision than simply solving today’s problem. And they make upgrading donors so much easier. Remember that upgrading can come in small packages. It sounds counterintuitive, but hear me out on this. It’s great to get a $50 donor to upgrade to making $150 gifts. But don’t overlook that donor who gave $25 last year but gave you five $25 gifts this year. That’s an upgrade too. However, chances are your current segmentation and reporting systems aren’t set up to identify that type of upgrade. Check your reports and segmentation to make sure you’re identifying these people as well. If cultivated correctly, they can add a lot of income to your organization, both now and in the future (hint: they make GREAT planned gift prospects). Increase the relationship and they’ll upgrade. Donors are human beings. They give for many reasons, but they continue giving and increase their giving because you make them feel validated and appreciated for their contributions. This is a given for major donors. But you’d be amazed at how big of an impact this can have on your middle donors and even the upper end of your regular donor file. Write them special handwritten notes, call them, invite them to your shop for a tour or out for coffee. These steps will deepen their relationship with your organization, and provide them with more positive experiences. And the next time you make an ask – even a stretch – they’ll be more likely to respond with a yes. Invest in a quality high dollar direct mail program. You might be tempted to just mail your standard package to every donor and vary only the ask amounts. That’s a mistake. Effective high dollar direct mail is much different; it’s less tactical, more relational. This is where you’ll see longer letters, live stamps, true handwriting, and even FedEx and UPS overnight packages, which work very well to upgrade donors. Say thank you more frequently. Engage your board to make thank you calls and write handwritten thank you notes to donors on a regular basis. You can even make it a standard part of each board meeting. Do this several times throughout the year, prior to when you’ll be making your most important asks. Embrace telemarketing. You might personally hate telemarketing, but it is a great tool for upgrading donors. Telemarketing allows you to build personal relationships through conversation, allows donors to feel like you’ve heard them (both the positive and negative), and gives you time to tell more of your story in a highly personalized way than direct mail or e-mail. You’ll also be able to reach more people on your file who aren’t necessarily responsive to other channels like mail. Host strategic cultivation events. If you’re trying to upgrade $20 donors to the $50 level, you probably don’t need to host cultivation events. But if you have a good group of $500 donors that you’re trying to upgrade to the $1,500 – $5,000 level, events are a great tool. The best events tend to have the feeling of exclusivity and access, of these donors being “insiders”, and having the opportunity to be the first to know/invest in something special. These cultivation events will deepen engagement around your donors’ passions and show them how very important they are to your cause. Upgrade through integration. Some of the most successful middle donor upgrade campaigns I’ve ever worked on have utilized an integrated direct mail, telemarketing, e-mail, video and face-to-face strategy. Integration helps you increase the frequency of your touch points, communicate the same message in different and increasingly compelling ways, and to leverage each channel to increase overall response. Want to learn more? I’m hosting a webinar that Andrew’s presenting called – Maximizing the Middle: Strategies and Tactics for Increasing Middle Donor Income. In this session Andrew Olsen, CFRE, will share the demographic and psychographic differences that make middle donors unique. You’ll learn the best (and worst) ways to engage these donors to deepen their commitment (and giving!) to your organization, AND we’ll look at three case studies to see the specific tactics other nonprofits have used to increase middle donor giving by as much as 400%. This webinar is now sold out! Click here to buy a copy of the recording! You’re not going to want to miss out on this knowledge! 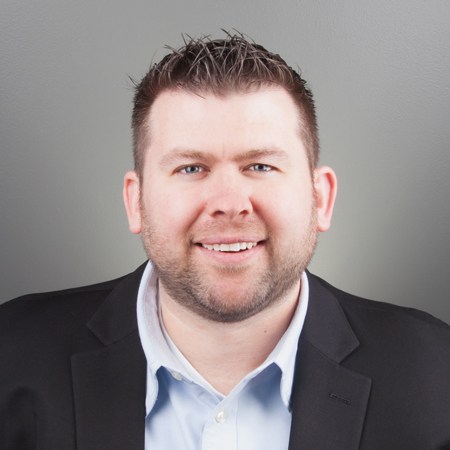 This blog was originally posted on Andrew Olsen’s Blog Fundraising Fundamentals. Andrew Olsen, CFRE, is Vice President, Client Services at Russ Reid – an Omnicom ad agency serving the nonprofit sector. Click here to read Andrew’s full bio. This entry was posted in #DonorLove, Annual Giving, Charity, Data, Direct Response, Donors, Fundraising - General, Guest Blogger, Major Gifts Fundraising, Non-Profit Organizations, Philanthropy, Upgrading and tagged #donorlove, guest blogger, mid-level giving, middle donors, upgrading by Maeve Strathy. Bookmark the permalink.